The three pigs are on the retreat from the big bad wolf who is not only threatening to blow their house down, but also planning to steal their free spins and bonuses. This quirky 5 reel online slot game is framed across the stereotypical straw house that houses the pensive 3 pigs. The graphics on this online slot make this game very endearing and approachable to play while admiring the stern defiance of the three little pigs as you pick up some porky cash prizes. Created by slot gamers, for slot gamers Quickspin understand their clientele, as fans themselves every region within the company is involved in the demo testing for these phenomenal looking slot games. They claim their most important product is their high-quality video slots and because of this they have positioned themselves prominently on both desktop and mobile formats widening their potential reach whilst ensuring the stunning artwork is seen to its fullest potential. The overall quality has resulted in the development one of the world’s most successful online casinos. Leaving nothing to chance, the time and detail put into these video slots have formed fully realised characters and environments for a fully immersive experience. Huff, puff and blow that house down. 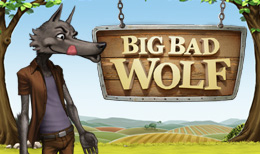 Inspired by the story of the three little pigs, Big Bad Wolf are taking you into this fairy tale realm helping you to discover secrets and riches told only in story books. During the player’s time on this classic 5 reel, 25 pay line machine they may encounter a number of bonuses, from the classic wild symbols to “blowing down the house” helping this game to keep you entertained from start to finish. The standard wild symbol is represented by an illustrative beehive, this substitutes all none-bonus symbols in aid of helping the player to find a winning pay line. Though within this machine the beehive is not the only wild you will come across, entitled “Pigs Turn Wild” player’s may also be offered a number of additional bonuses. When these pigs are in play, every winning spin will see a “Swooping Reel Feature” meaning all winning symbols will disappear in order for new symbols to fall into place. In addition to this when you win 2x in a row Pig 1 will turn wild for the next set of falling symbols, if you manage to win 4x in a row both Pig 1 and Pig 2 will turn wild for the next set of falling symbols with 6x in a row forcing all 3 pigs to act as wilds for the next set. The wolf within the game represents the scatter symbols, these will trigger the Free Spins Bonus and gift the player 10 FREE SPINS. Players can further add to these spins during the Blowing Down the House bonus round. To access this bonus, collect moon symbols during the Free Spins Bonus, 3x moons will blow down the wooden house resulting in 2x additional free spins. 6x moons will not only give you 6x additional spins but will also add a 2x multiplier onto the duration of your Free Spins Bonus. The large range of additional and unique bonus features throughout this game will help to keep you absorbed and amused. Combining entertainment with the truly stunning graphic content and familiar story line Quickspin has delivered yet another online slot masterpiece. With the additional twist of playing the villain within this classic childhood story, you will not be disappointed by the amount of work and detail that has went into creating this game.